If you want to lend your support, the petition is being organised on the link below. It does seem strange to be talking about what I regard as the real Whitesnake again after how many years, well thirty in actual fact. David has announced the first decent archive DVD release from the band’s classic era, specifically the Slide It In live tour, with footage from Super Rock Japan and Sweden in 1984, which was Jon Lord’s last show ever as a member of the band, plus bonus audio CD disc with other live extra tracks (NOT available separately). It makes a real change after all the many best ofs which have been the pattern up until now. We’ve delved into our own archives to take a closer look at the period and see exactly what’s on offer on the review pages. The DVD can be pre-ordered at DTB Online store and is due in November. 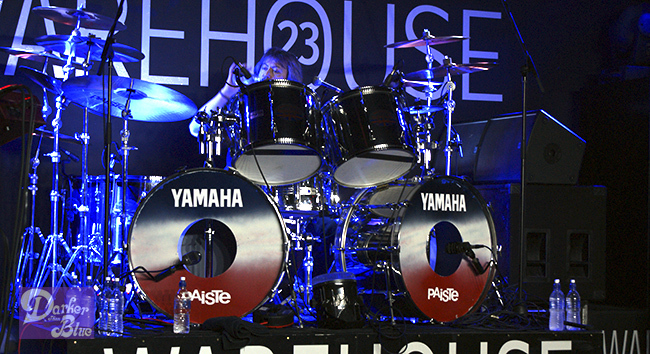 One of Cozy Powell‘s custom Yamaha kits had an outing on the recent Graham Bonnet tour. Very strange to hear the sound after so many years, but unmistakable even so. Details of the Wakefield show (where the kit above was pictured a few days ago) and a couple more photos on the site (plus early details of an upcoming biography of the singer) here. Photo © Simon Robinson. There’s a new Tommy Bolin set due late August in America, titled Whirlwind. No final details of European editions yet but these will be available through DTBOnline. There is a limited edition but seems to be for US only. Other new titles due in are vinyl of Jon Lord’s Concerto. Vinyl of the latest Blackmore’s Night album has been issued but is not being distributed by normal channels so we cannot supply it. The Phenomena Project is assembling (sounds like something from an upcoming Marvel Comics film!) for at least one festival slot next year at Sweden Rock Festival 2014, with Glenn Hughes – Vocals, Neil Murray – Bass, and Bernie Marsden – Guitar, plus Martin Kronlund – Guitar, Perra Johansson – Drums, Ian Haugland – Drums. Dating back to 1985, this was a series of studio albums with contributions from Glenn and others, but never toured. Still with Glenn, the Hughes / Thrall album is reissued on vinyl shortly, 180 gsm edition (pre-order at DTBOnline). I wonder if the Jon Lord BBC show we mentioned on DTB before is this: “Keyboard wizard Rick Wakeman pays tribute to his friend, Deep Purple’s Jon Lord…” Airing at 23:25, Sunday, July 14th, BBC1 TV but in the East Midlands only (due to the Leicester connection I assume). Hopefully it will be on iPlayer after, most local programming is. Talking of the man, it’s now confirmed that the memorial show takes place in April 2014, with lots of guests. We’ll let you know more when we can on the Jon Lord page on the site. I know some people were hoping to travel to catch this and a DP UK show in October this year as they were originally hoping to stage it in October. There is also a special book celebrating Jon’s life in words and pictures in the planning stages, about which more shortly. All a bit quieter over in Deep Purple land, apart from Don Airey doing a freebie show in Italy in August, with a Deep Purple tribute band. Date and flyer on the site here. On the back-catalogue, we should note that the 1999 Deep Purple Live At The Royal Albert Hall set is deleted; anyone needing the 2CD set should move quickly. A customer came to us asking if we could help and were surprised to find it had gone. We still have some in stock at DTBOnline store (or you can pay over £30 on Am*z*n!). A marvellous weekend for everyone really, and you have to think with hindsight it was one of the high spots of the reunion. It’s great that Jon got to do this when he did. The DPO Archives are promising us an anniversary video single to mark the release forty years back of the Smoke On The Water single in America. It took EMI UK four years to finally release this here, not until the band had split did they put it out on 7″ in 1977. Funnily enough, the radio comedy show The Castle (recently repeated on Radio 4Extra) have the riff done on medieval instruments which sounds great (along with many other famous rock hooks). Also due is a reissue of the Live In Copenhagen ’72 DVD. The Wait For The Riochet book majoring on the Deep Purple In Rock period of the band is now in the final proofing stages and on track to go to print later this month. There will be a cut-off date for pre-orders announced shortly so if you want the copy with your credit in best get a wriggle on. If the title has passed you by, check it out on the site here. 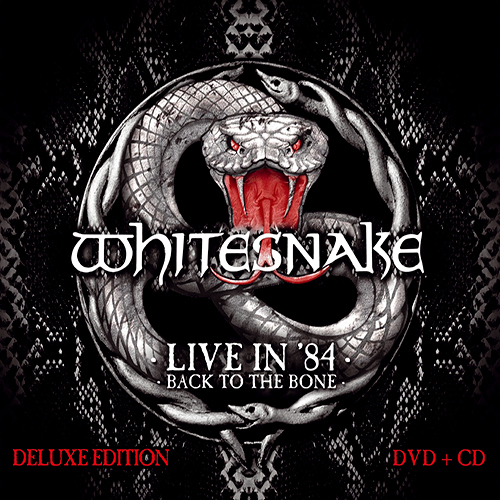 The latest live Whitesnake album Made In Britain is now shipping, a double CD set (see DTBOnline). Apparently Whitesnake showed head and shoulder shots of Jon Lord, Mel Galley and Cozy Powell during the performance of Gambler on the recent UK tour. Until I heard this I hadn’t really thought how many of the classic line-up we’d lost. Mention of Mel sort of leads us obliquely to Judas Priest (How? Mel, Trapeze, Glenn, Deep Purple, Roger Glover, produced Priest…. peasy). John Tucker was asking me aboiut The Flying Hat Band, who supported Purple for a few shows in Europe in January 1974. 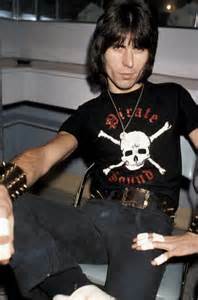 This was Priest guitarist Glenn Tipton’s outfit and we were wondering how on earth they came to be selected for the tour (given that most of Purple’s supports at that time were usually bands people had heard of – Alex Harvey Band, Tucky Buzzard, Elf, etc.). Let us know if you managed the band at the time! Issue 6 of Swedish magazine Retroculture majors on Deep Purple. Though mostly in Swedish, interviews with Coverdale and Johnny Bolin have been included in English by editor Mike Eriksson. The only worry I have is the magazine’s website name which in English reads a bit strange, so I’ll just paste it as a link! Thanks also to the guys at Hush magazine for their latest issue, 41. 75 pages of DP and family content, along with other bands. That comedy film Discoverdale we’ve been mentioning for some time is now getting screenings in various art cinemas around the country. Very nice of the producers to send us an invite to the London premier (though the thought of driving all that way in the recent heatwave to sit in a cinema didn’t really appeal). 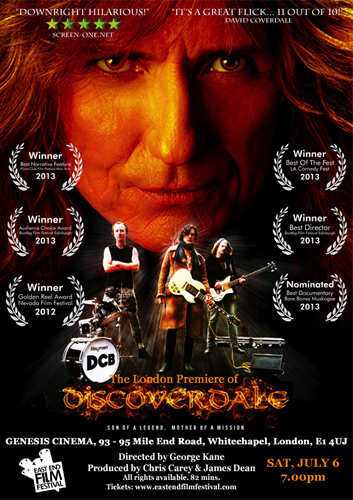 The flyer actually featured quite a big photo of David Coverdale. You can visit the movie’s official site to read more. Can’t wait to see it. Thanks also to Jacqueline Stokes, James Bateman, Tim Summers. Cue the opening music to the 1812 overture…. Tonny Steenhagen on the drums. Cozy’s drums. He says the sticks (Cozy’s) were like broom handles. ‘somewhere over the Rainbow…..in Cornwall’. Tonny does some work for a Youth Centre in Saltash, Cornwall (www.livewireyouth.com) and the centre is being supported by quite a few ‘bona fide’ rock stars. The drum kit was given on a long term loan to them last year and is sometimes on display to the public on open days. Do check though as for obvious reasons it’s kept elsewhere. 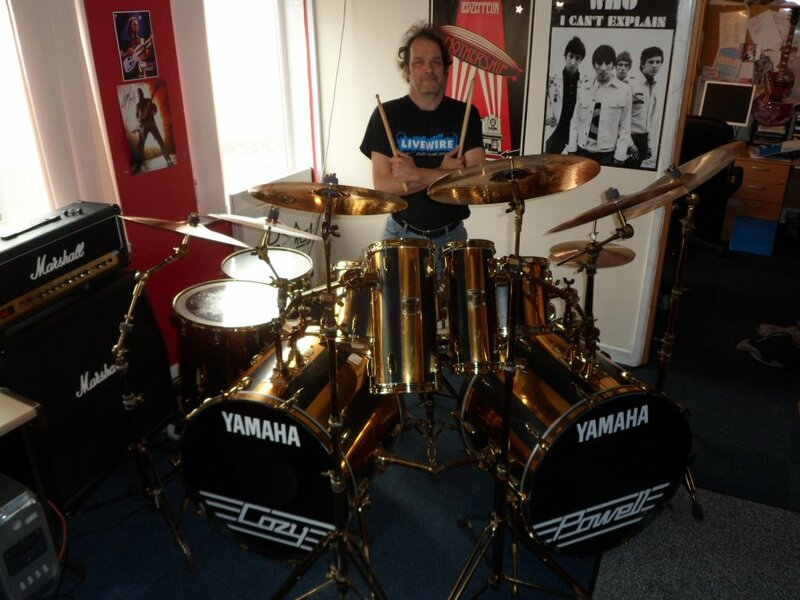 We think it’s one of Cozy’s custom gold and black Yamaha kits from his time with Sabbath at the end of the 1980s but drum experts are invited to put me right! If you missed it we covered one of Cozy’ flight cases which turned up a while ago. COZY POWELL : I was chatting with someone last week who actually went along to the auction held after Cozy’s death (in April 1998). I’d heard various stories about the cassettes and tapes before, which I seem to remember ended up being bought by one of Cozy’s friends from the group Hammer. Apparently they just cleared everything out of the garage and put it into auction. 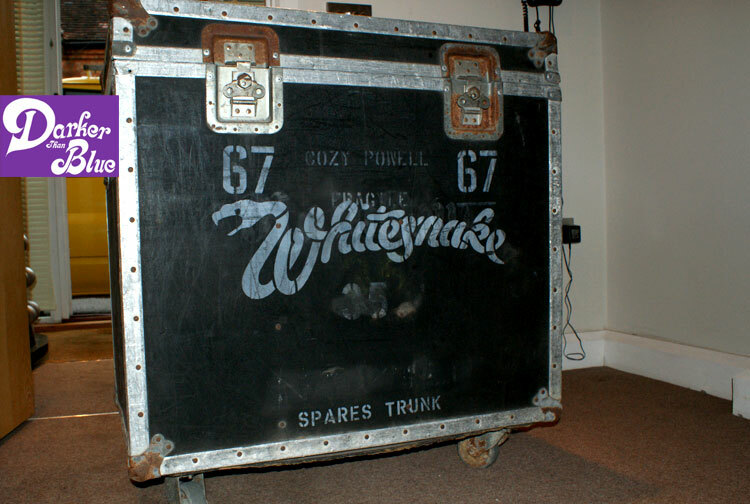 Anyhow, this chap we know (who has asked not to be named) ended up bidding and winning a vintage Whitesnake Cozy Powell flight case, which now sits in his office. He regrets not bidding on a pile of signature drums sticks though. Neil Murray went along but just to watch. I was able to take a couple of photographs of the case, and will post one here.